I recently took my son to Disney World at the age of 7 months. 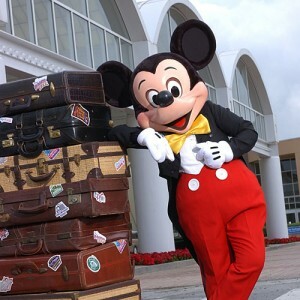 I learned so much about all aspects of taking a child to Disney and would love to share some of my packing tips! Reclining umbrella stroller- we had the chicco echo. You will want an easy to fold stroller for the buses, but will also want the recline option for naps at the park. Are you interested in learning more about a Disney vacation? My services are 100% FREE! “Like” my fan page on Facebook! 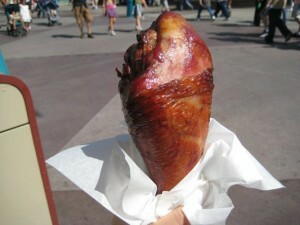 Food Allergies and the MAGIC of Disney! Last week I took my son to Disney World for the first time. He is only 7 months old and beyond the worries of diapers, strollers, packing, etc; he has a milk protein allergy. Since I am nursing, it is pretty much like I have a milk protein allergy. You think, just skip milk and cheese right? Wrong, milk is in many products like spaghetti sauce, bread, fried foods, processed foods, buttery toppings, and many other items. Over the last 3 months of being dairy free, I have struggled with restaurants not being able to accommodate the allergy, servers guessing on if milk was an ingredient, and having cheese mixed into my meal due to sloppy kitchen procedures. Needless to say as much as I love Disney, I was pretty nervous about the allergy. Well due to the magic of Disney, the food allergy was handled perfect and we had a great trip! Now let me talk you through the “Disney Difference”. Planning ahead. You can note food allergies when you make your dining reservations (up to 180 days in advance). That way the restaurant is already aware of your special needs when you check in at the location. 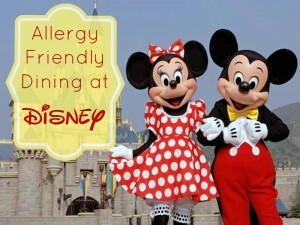 If someone you are traveling with has very severe allergy issues or multiple food allergies you can also email Disney ahead of time to get more information. However, for the common top 8 allergens, this is not necessary. Quick Service meals. If you are dining at a quick service location, you can simply ask to speak to a chef about your options. The chef will come out and explain everything you can and can’t eat and will also offer to make the allergy meal special for you. I had a chef make my fries in a separate fryer so I could still have them! Many locations also had a host of dairy free snacks from my favorite brands back home. Snack carts. If you are craving a Turkey Leg or other snack, but have a food allergy, no problem all the locations are stocked with allergen books that you can ask to review. I knew this from working at Disney in college, but being on the other side of this was so helpful! You simply ask to see the book, and ALL the ingredients of the product are listed. No guessing, no worries, and no fuss! I was surprised how many things I could eat! Table service meals. These experiences were by far the most magical! Right when you are seated, the chef comes out to speak to you. They explain what you can and cannot eat, walk you through any buffets, and offer to make modifications to the items you can’t eat so they are safe! The meal comes out with an “allergy” stick in it so you know it was prepared correctly. I think the best part was how nice the servers and chefs were. I am so used to apologizing for being a pain, asking for the few items I can eat, or having people get annoyed by the allergy. The chefs were so nice and treated me like a princess! They even made me a dairy free shake at Sci Fi! As a vacation planner, this trip was very educational. Like I said, working there you learn the procedure, but as a college kid I had never had any personal experience with food allergies. I feel confident sending my clients with food allergies to Disney, knowing their experience will be first of all safe and second of all magical! As a first time mom, this trip was amazing! It was like the food allergy was not even an issue! Whether you’re new to Disney or a mouse-eared veteran, you’ve probably heard (or seen) the pins that visitors to the parks wear proudly on lanyards around their necks. You’ll spot them on Cast Members, too, and it’s okay to ask about them…as a matter of fact, it’s encouraged! Let’s talk about Disney Pin Trading! 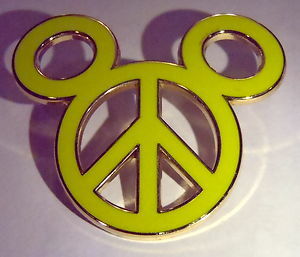 Disney Pin trading began with Disney’s Millennium Celebration back in October of 1999 and as of this writing, thousands of designs exist. THOUSANDS! You can’t enter a gift shop on property without spotting a display of them, and they’re available in pretty much any Disney character, attraction or milestone imaginable. I should warn you: Disney pin trading and collecting is addictive! 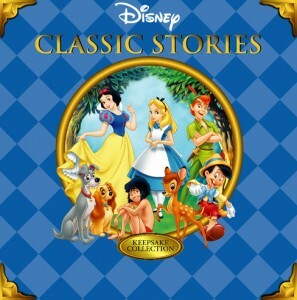 We started off with some favorite characters, but once we discovered how much was out there we were all HOOKED. My boys have huge collections: James is a Stitch disciple; Austin has two lanyards, one for his favorite rides and the other strictly for Star Wars related pins. They love pin trading in the parks, but once they’re home they display them on plain black canvases we purchased at JoAnn Fabrics. They’re a sort of growing souvenir of our family trips, and I know the boys love that they’re completely unique and ever changing. I keep my favorites on a board over my MickeyTravels desk with my own most treasured pins: a peace sign Mickey head, Cinderella’s carriage, the Grape Soda bottle cap from UP my husband gave me on our most recent trip, and of course more than one Mickey: as Steamboat Willie, in his full-color glory, and Mickey wearing a Santa hat. One of my favorite parts of this kind of souvenir is that no two will ever be alike…each month Disney issues new pins and retires old ones so that there are a constantly changing variety of them. So if you see a collection you love, well, you should probably snap it up because next time you visit one of the parks it might be gone. Then again, you can make the collection by trading. Sure, it’ll take a while, but isn’t that half the fun? Getting started with Disney pin trading is simple: you can check out the Disney Store online for current editions and order a starter set. If you’re lucky enough to be in the parks, you can grab a few in the nearest gift shop. Be sure to get a lanyard too; you’ll want it to display your favorites. And then you trade! With other resort guests, with Cast Members working anywhere on Disney grounds, you name it! 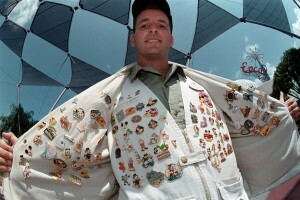 Simply approach the cast member and say, “I’d like to trade.” Be sure to offer one they’re not already wearing and offer your pin first, with the back intact. They give you the one you selected, and just like that, you’re a pin trader! One note: be sure that you’re trading for authentic Disney pins. 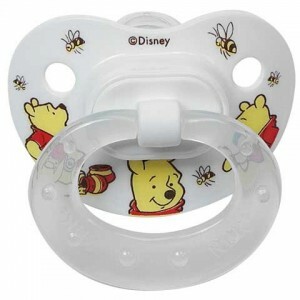 You can do this by checking the back stamp: it will classify the manufacturing date, whether or not it’s a limited editon or series, and the official Disney mouse-ear logo. For some real excitement, be sure to stop in at Pin Central in EPCOT or Pin Traders at Downtown Disney…they’ve got amazing assortments of pins to purchase, in addition to trading boards and usually a pin trader or two. Let’s get started with your Disney pin trading! Have fun and happy trading! Contact us today to learn how you can experience the thrill of Disney Pin Trading and for all our other FREE Disney vacation planning tips and services!